I knew I wanted to do something fun and outside the box for my Christmas Tree this year and hence, the Snowman Christmas Tree was born. 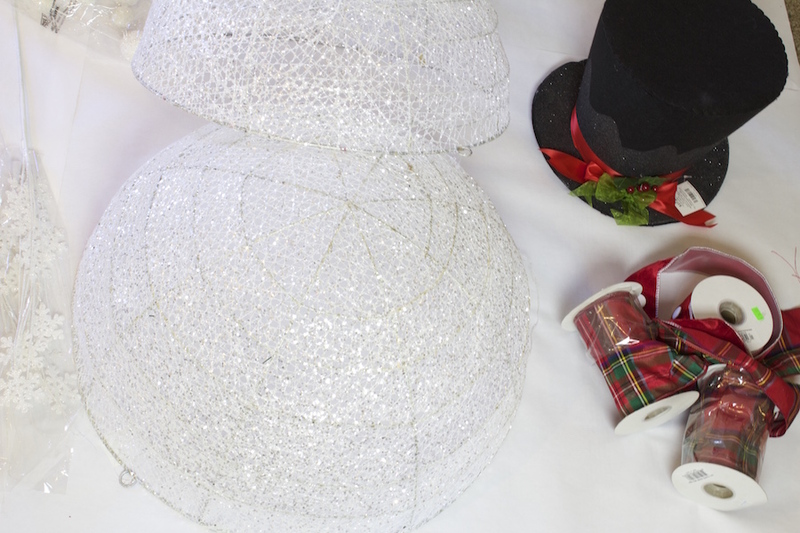 Making your own Snowman Christmas Tree is so much fun and can be done using a variety of materials. Making a snowman Christmas tree is actually a lot easier than it looks! It’s so much fun to bring him to life as you decorate your tree! 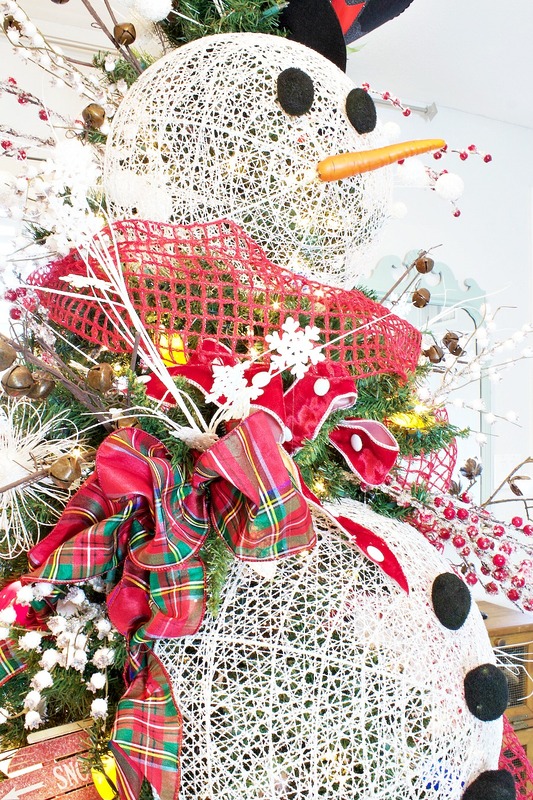 Snowman Hat – I love this Snowman head/hat tree topper. picks – love the ones that have cotton ball type things at the end for the “snow” effect. BUYING TIPS: When you are buying stuff for your tree always buy in odd numbers. Buy the “picks” in numbers of 5 or 9. Get a few big elements… mine were the snow balls and large snowflakes. Get at least two different ribbons to fill in any holes. First thing that you will want to do is..lay out all of your item on the ground in piles. As you can see I have a few different picks that I love. The white balls are fun, the snowflakes add a great element, the bells are just dreamy and the iced cranberry picks add a pop of color. 1. First, add lights to your tree. – My Tree is pre-lit but I found these cute vintage looking ones at a store in Mesa, AZ called Orange Patch. We love to mix and match lights on our Christmas Trees. 2. 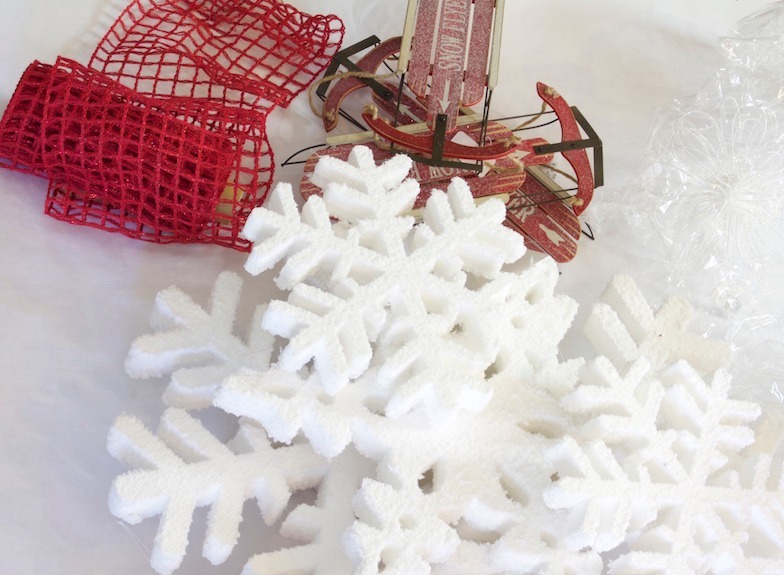 Large scale decor pieces – My main element was obviously the snow balls which I used a bit of wire to wire it to the center of the tree. If things are heavy or you want them to stay in a specific spot, use craft wire to secure them to the trunk of you tree. This also helps little toddlers from pulling things off. 3. Add ornaments – work with your biggest to the smallest of the decor and ornaments that you have. Load up your tree. You really can’t over do it! 4. 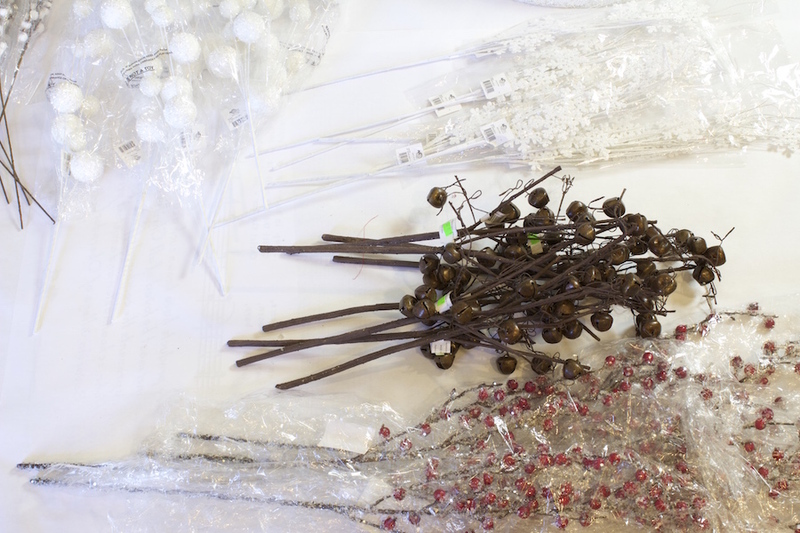 Picks and Sprays – We use a variety of picks and sprays in all of our trees. These are the decor pieces that come on a stem or stick that you can shove in between branches. We add most of them to the top and then a few throughout the body of the tree. Use a variety of sizes, shapes, textures and colors. 5. The last thing that you will want to add is the ribbon. 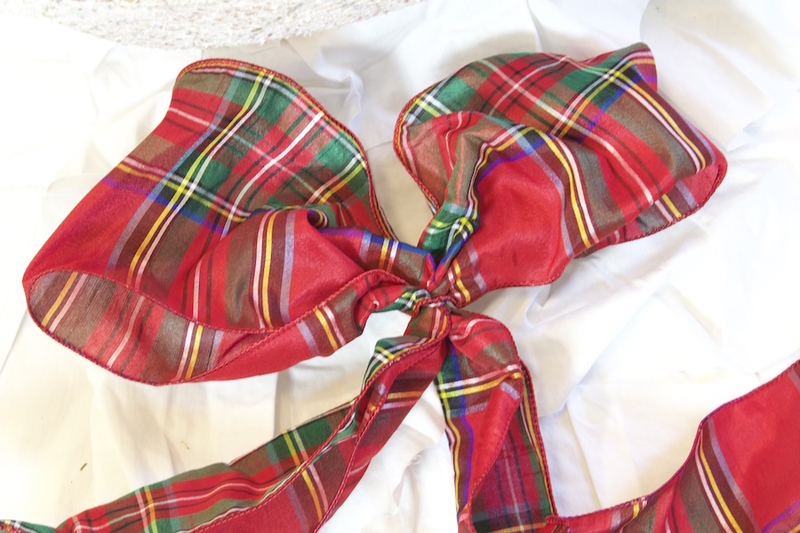 Don’t waste your ribbon making full bows. Get wired ribbon and just do simple bunny ears and two tails like the picture below. I used a bit of thin wire to keep the bunny ears together. I also used 3 different types of ribbon to add lots of texture. Fill in any holes that you have with the ribbon. 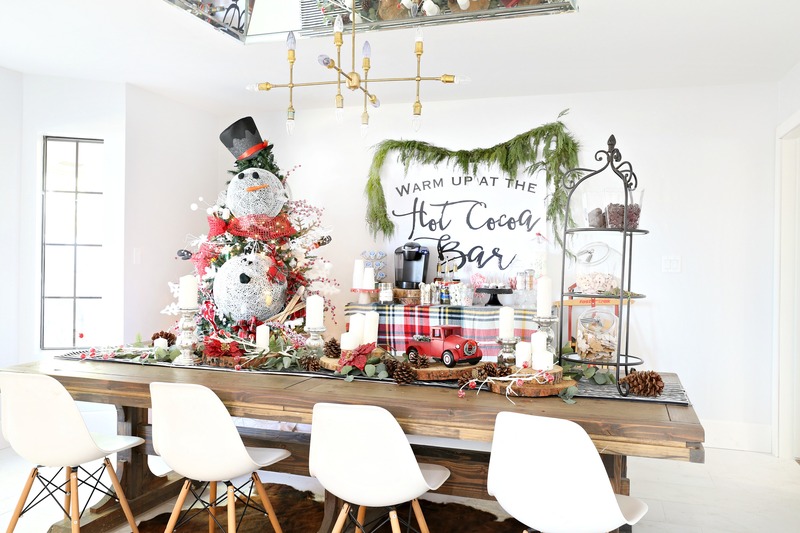 I love how he looks next to our Hot Cocoa Bar! If you have any questions please feel free to leave a comment! Hope you enjoy the new member of the family as much as we do! Merry Christmas! Savannah!!! So fun!! I want a fun Christmas tree now! Oh my word, this is just amazing. What a fun idea and just the cutest ever. What are the white balls called that are used for the snowman body? I plan on going to a florist to see if I could purchase these. 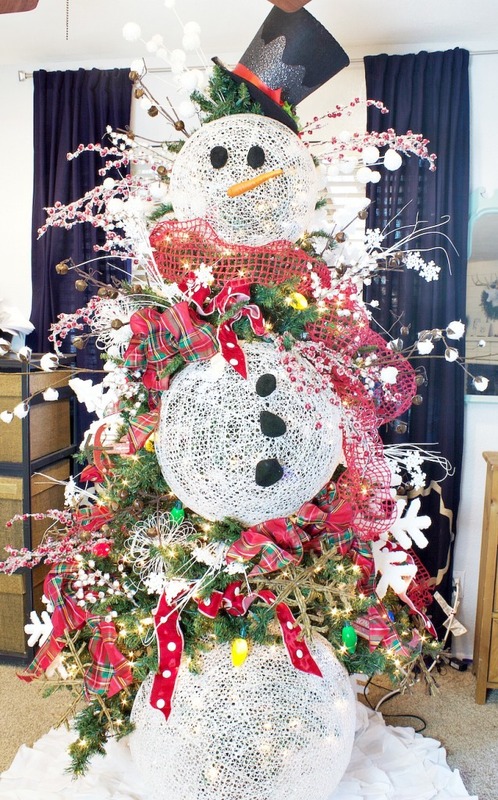 My home is going to be in a Christmas Walk and would love to have a snowman tree like this one! Hello, I love your Christmas tree😍 and I would love to make it this year, but I think the big problem for me is to get the big snow balls. Could you please tell me where to buy them or how to make them? What are the large snowballs called and where can I find them….this is thebest tree ever!!!! Did you ever find out what these balls are called??? Hi, I wanted to know what are the white snowballs called and can I add anything to the snowman to make him or her look cooler? What are the balls called and what sizes for this snowman? I am show casing my home for a Christmas Walk and this would be unique!! Thank you!! Hi Becky! The balls were made of wire from the company where I bought the snow man. It’s local here in Phoenix. Thanks! Hi! I was wondering what you used as the “coal” for the snowmans eyes and buttons? Also, do you remember what the big white half balls are called from the floral shop? I never would have thought to do this. I love it!